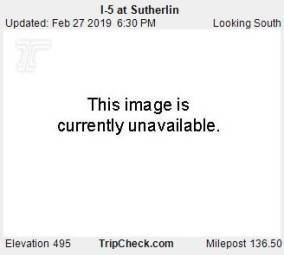 It's 22:08 in Sutherlin, USA right now. I-5 at Sutherlin A view of the current traffic situation on the I-5. Roseburg, Oregon: Roseburg Regional Airport, 12.1 miles away. Elkton, Oregon: ORE38 at Elkton, 21.3 miles away. Coos Bay, Oregon: View of the Coos Bay, 45.5 miles away. Springfield, Oregon: Springfield Weathercam, 47.6 miles away. Grants Pass, Oregon: Grants Pass Weathercams, 65.7 miles away. Blue River, Oregon: Blue River Webcam, 71.7 miles away. Medford, Oregon: Medford Weathercam, 76.8 miles away. Foster, Oregon: Foster Elementary School, 77.4 miles away.